Perennial Bluegrass: Good! Annual Bluegrass: Bad!! | Gardens Alive! Perennial Bluegrass: Good! Annual Bluegrass: Bad!! Question. Annual Bluegrass (Poa annua) is spreading like wildfire in our front yard. I have tried two different chemical herbicides and digging it up, but nothing seems to work. Our yard looks like a patchwork quilt and my husband is embarrassed. We use a lawn service to cut our grass and I don't think they clean the lawn mower between yards; I believe that's why it's spreading. I know this is not the time of year to re-seed the lawn but my husband is desperate and wants to do it anyway, despite the fact that the seed might not germinate because of the weed products that have been put down and if they do germinate the grass probably won't survive the summer heat. I have noticed that people who cut their own lawns in our neighborhood don't seem to have this problem. Thanks for your help! Answer. Well, the first thing you need is a chill pill. You've already done enough damage to yourself and the environment with those two ill-advised herbicides, and—as you note—new seed will almost certainly fail to establish due to the time of year, those herbicides, or both. You could tear up what you have and lay sod now, but that tends to be prohibitively expensive on large lawns. We get a lot of emails about annual bluegrass becoming a lawn pest (the bluegrass that people use with great success for Northern lawns in full sun is a perennial bluegrass of a different species; specifically Poa pratensis for Kentucky blue), so we called our favorite lawn care advisor, Dr. Nick Christians, turfgrass professor at Iowa State University. "Annual bluegrass may currently be the worst weed problem on golf courses," he begins, "because—as golfers know—the greens on those courses are cut very low to facilitate the game. But a low cut invites all sorts of weed problems, especially this one, as annual bluegrass thrives with the kind of cut that really stresses the 'wanted' grass. It also loves high fertility, and that's a double whammy, because golf courses often use huge amounts of fertilizer to try and compensate for their low cut. It also greatly prefers wet soil, and golf courses need to always be watering to prevent their short grass from burning up in the summer heat. "So when this weed shows up in a lawn, it's often a result of that same kind of mismanagement; cutting the grass too short, applying too much fertilizer and watering too much and too often." Not because the lawn service doesn't clean their mowers between jobs? "No—and I've never heard of a lawn service that did clean their mowers in between jobs. The only thing the service might be doing wrong is cutting the grass too short. As you and I have been telling your listeners for over a decade, cool season lawns like bluegrass and fescue should be cut at three inches in the sun; 3 ½ in the shade; and that's the height after mowing. "Cut shorter than that and you invite weeds. Make the fatal mistake of trying to imitate a one inch golf course cut and something like Poa annua is sure to move in." Why doesn't the short cut hurt the annual bluegrass? Doesn't it have the same needs as its perennial cousin? READ COMPLETE ANSWER "Heavens, no. First of all, there are 500 different species of bluegrass; everyone a little different. And while 'good' bluegrass requires what most people consider a high cut, Poa annua thrives with a low cut; it's a huge seed producer and it can produce those seeds when it's cut as low as one-tenth of an inch." "Actually, some very reputable sources say it does well even lower than that. Now, this Poa is a winter annual; the plants themselves typically die over summer and the seeds germinate over the winter. So this couple might beat those seeds if they tear up their lawn in early August and reseed with their desired grass around August 15th to September 1st. The new grass should have time to get established and outcompete the Poa—unless they cut it too short again, of course. "But I don't think their problem IS annual bluegrass." 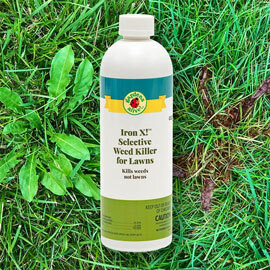 "Lawn owners are often notoriously bad at identifying weeds and problem grasses. Now your listeners say that their lawn looks like a patchwork quilt, which would be right, as annual bluegrass is lighter in color than any of the true lawn grasses they'd be using. But they don't mention the seed heads; this grass produces enormous numbers of seed heads, and they're extremely obvious. And annual bluegrass doesn't spread rapidly the way they describe. It's more of a persistent problem that's only obvious at certain times of year." "When I hear the words 'spreading like wildfire' or 'taking over', I think of a rapidly growing highly aggressive perennial grass, like Bermuda."